Be the first to share your favorite memory, photo or story of Sammy. This memorial page is dedicated for family, friends and future generations to celebrate the life of their loved one. 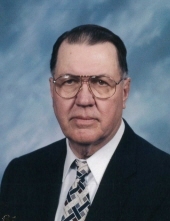 Sammy Mack Rees, 88, of Kingdom City went to be with the Lord on Saturday, February 9, 2019. Sam was born on July 4, 1930 in Boone County, Missouri, the son of the late Alfred S. Rees and the late Martha Elizabeth (Boucher) Rees. He and his wife Joe Ann (O’Neal) Rees were united in marriage on June 15, 1954. She survives his passing. Sam served in the United States Army, Fort Riley, Kansas from 1951 until 1953. He worked for the United States Postal Service in Columbia for 39 years as a mail carrier, supervisor and Post Master. He also served as President and Vice President for the Postal Retirement Group. Sam was a long-time and active member of Richland Baptist Church. He served as a deacon and Sunday School teacher, and enjoyed his time with the Recycled Teenagers. Sam knew the importance of community involvement. He served on the first Boards for both North Callaway Fire Protection and Kingdom Christian Academy. He was an Eagle Scout and a member of Green Valley Gun Club in Columbia. Sam loved farming, raising his cattle, chickens, and turkeys, and gardening. He enjoyed reading and studying his Bible. He also liked to scuba dive, hunt, fly fish, and spend weekends at the family vacation home at Lake Ozark. In 1966, he received the Sharp Shooter Trophy form Camp Perry, Ohio. Sam’s greatest pleasure was found in time spent with his grandchildren, great-grandchildren, and at family bar-be-ques. Sam is survived by his wife Joe Ann of Fulton; daughters, Rebecca Westling of Fulton, and Robin Rees-Love (Floyd) of Kingdom City; brother, Frank Scott Rees (Jeanette) of Ava; grandsons, Sam Viggers of Newton, Tx., Sam Westling (Leslie) of Gladstone, David W. Westling, Joe Wieschhaus of Kingdom City; Kristopher Wieschhaus (Hillary) Oswego, Ill.; granddaughter, Melissa Wieschhaus Appling (Mike) of Mexico; great grandchildren, Rees, Brady, Cora, and Michael Wieschhaus, Brandon, Logan, Chase and Sydney Westling, Ryan Wilkinson, Dylan and A.J. Leon, Sairus Viggers, and Emilia Westling. He was preceded in death by his parents; brothers, Thomas and Bill Rees; sisters, Martha and Beverly Rees; and son-in-law, Kip Westling. Funeral services will be held at 1:00 p.m. on Saturday, February 16, 2019 at Richland Baptist Church in Kingdom City with Pastor Nick Drake officiating. Friends will be received from 11:00 a.m. until the time of service at the church. Interment with Military Honors will be in Richland Cemetery. Memorial donations are suggested to Central Missouri Honor Flight, Richland Baptist Church or Alzheimer’s Association, c/o Maupin Funeral Home, 301 Douglas Boulevard, Fulton, MO 65251. To send flowers or a remembrance gift to the family of Sammy Mack Rees, please visit our Tribute Store. "Email Address" would like to share the life celebration of Sammy Mack Rees. Click on the "link" to go to share a favorite memory or leave a condolence message for the family.